Internet explorer was a horrible browser. Internet explorer was the only browser available on school computers. OK... so there were three sad conclusions. The final one being that school computers did not allow you to install software on them. So I began trying to install programs on different medium. Oddly (sadly) enough, the first thing I tried using was 75mb Zip disks. Yeah! I installed Firefox (at the time I think it was called Mozilla Firebird) onto my Zip disk and I was able to run it! I must have been the coolest freshman BYU ever saw! Well... Running applications on a USB drive has come a long way since then, so I want to try to lay aside any biases I might have and do some (somewhat) scientific tests to determine which I like more. LiberKey or PortableApps. I found out first about PortableApps.com (I am quite sure that PortableApps was the first website to start compiling software that could be run on a USB drive). I thought it was great when I first used it. I loved how it had a lot of open sourced software that I use on a regular basis. I used PortableApps probably for about the first five years after it was released. I decided to try LiberKey out after I read an article basically knocking LiberKey of copying much of what PortableApps had already done. I had pretty negative vibes about this but was just curious to try it out and I was blown away by it. It had features that I was looking for in PortableApps. I made an almost immediate switch to using LiberKey and have been using Liberkey for the past four years or so. At this point I still recommended PortableApps to friends and family (I felt it was a bit more true to open source) but I used LiberKey for myself. I have been checking out PortableApps on and off through the years to just see what new features it gets. After the last major release I decided to switch over again to PortableApps and give it another go. At this point, I really have not been able to convince myself as to which I like more. LiberKey is feature rich but has been buggy for me. PortableApps has been quite stable but lacks some of the features I love in LiberKey. So here I am now running a bunch of tests to help me decide which one I like more (and therefore is obviously the better choice that everyone should use ;-) ). The installation process is basically the same for both. If I have time, definitely will read through. Seems a very good article with lots of effort spent by the author. Thanks. I have been leaning toward Liberkey from a usability standpoint but the ethical questions were an issue. Assuming I don't recommend it to those who wouldn't "get it" I think I can use it myself without guilt. Yeah... I keep on moving back and forth myself. Actually, just a few weeks ago I switched back over to using Portableapps. They implemented some of the features I rely on (specifically auto launching applications). I still like the software selection a bit more with Liberkey, but I find Portableapps to be slightly less buggy. If anything I like the fact that there seems to be a bit of competition driving good ideas. First of all, the work that went into the comparison is much appreciated. Mention is made of the fact that LiberKey has about 30 additional programs - it would have been nice to know what they were so as to determine whether that is a deal breaker. Also, was any effort made to contact Portable Apps about providing the missing features/apps. It is entirely possible they don't realize that these features matter to many individuals. I'm very much a supporter of adherence to the "Open Source" model so that pretty much settles the matter for me but choice is always good and I'm delighted that you offered, what seemed to me, to be a very impartial comparison. Thanks again. Have a happy! On of disadvantage that I see in Liberkey is I cannot used Liberkey apps and Local installed apps simultaneously. Portable Apps is ahead of this because Portable Apps used a separate user data from the local installed apps. Thank you for this comparative. I like that you take the time to really test several aspects of the two suites and how you present your research. I like both of them, but here is the point from where I decided to come back to PortableApps, despite of their use of that Autorun.inf and their lack of description of the apps in the suite interface. I've found that apps in Liberkey can run only in through Liberkey. If you take an app folder, let's say you want to pass an app to a friend who wants to check it out, out of its initial location, it won't run. That's, for me, an important fact to consider. This really is an important factor. I had not considered this much until I suggested someone running VLC on their USB drive. I realized the Liberkey had no easy way to do this and I had to recommend PortableApps. I think that Liberkey is a more advanced application but, PortableApps.com has Skype and even has the new Opera Mail Client. I'm switching from Liberkey to PortableApps.com. Excellent article and blog BTW! Thank you. I have made the switch to PortableApps for the time being as well. I found that it offered a stability that I didn't have in Liberkey. I still like both quite a bit and will probably give Liberkey another go in about a year to see what has changed. I use Liberkey and have tried portable apps but could not get into it. I like the complexity behind liberkey and the fact that I can easily install both liberkey apps, portable apps, and normal everyday apps to the usb and have them work in the menu. "liberkey-is-illegal" it's totaly wrong, it's a questionable practice by Liberkey's concurent. Just read the 2nd post of the topic. I switched from Portableapps to Liberkey for one reason. The app-searchbar in Liberkey. 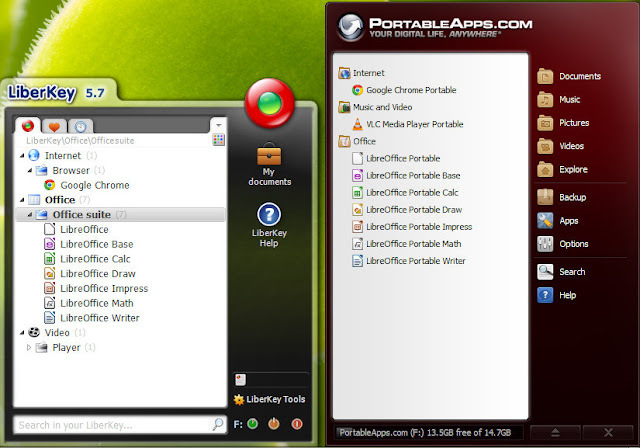 I put also portableapps-programs and other in Liberkey. I cannot remember everytime what the 350 tools exactly do. Example – I will rip a CD … Last rip was one year ago … What the name of the program? I don’t know. Where to find in the menu. - ¿CD/DVD? wrong nothing - ¿Tools? nothing (it is in audio) - but I know there was any. 1 minute later I have found an other program "Register Defragger" and I have forgotten the CD for 3 month. In Liberkey i can simple put in the searchbar the word "rip" yeah the name of the program is "freac" and it is one click away. I can also find the Portableapps-GIMP simple with the word "image". Now I am switching from Liberkey to Ubuntu Linux. I made the switch to Ubuntu a long time ago. I must admit though, when I use other people's computers, I always use Liberkey or Portableapps. Still not sure if I prefer one over the other though. I think you are wrong at the "Software Installation" point. Liberkey has a special feature called "install a group of applications", you can choose basic suite, standard suite, ultimate suite, and then select the apps you want or not. Then they install automatically without the need of any browser. Also I tend to prefer liberkey because of its system for associate common files to be opened with portable software (I know portableapps now has something similar but I find it buggy and not so efficient...). Thanks for your comment. I also really like how Liberkey associates the file types with your system. It is one of my favorite features of Liberkey. - There's an option to auto-install important updates. In PAP you have to manually select Apps / Check for Updates. I wish there was a way in PAP to configure it to auto-update all apps even when my PC is sleeping, just like what we take for granted in iOS and Android. - The menu search functionality is superior to PAP because it also searches the app description. In PAP when I search for "outliner" I should get a match for The Guide, but I don't because PAP only matches against the app title. The minor downside is that there's a higher chance you will find false negatives in LiberKey. - App installation/update appears to be more reliable. In PAP whenever I update about a dozen apps or more in one go, it almost always crashes on me (I'm using v11.2). This, compounded by the fact that PAP has no automatic update mechanism, makes updating apps a big chore. I haven't installed that many apps in LiberKey to say whether it's more robust, but so far so good. - The menu interface is faster. The first thing I noticed when I launched LiberKey was how sluggish it felt compared to PAP. I dunno, it reminds me of one of those Java apps from back in the day, or a ported Linux app that runs on top of GTK or something. LiberKey still felt cumbersome even after I disabled all animations. - It consumes little memory. I was shocked to see that LiberKey uses up about 3x as much RAM as PAP (15 MB vs. 5 MB). Even worse, the memory usage kept increasing the longer I used it (after about 10 minutes it was up to 19 MB already). - It appears to have a more active community than LiberKey. The latest version of LiberKey was updated two years ago, which suggests to me that development is very slow or even stalled (?). Also, I installed AIMP on both platforms and found out that the PAP version was slightly newer than the LiberKey version (build 1332 vs. 1324). In the end, I uninstalled LiberKey and went back to PAP. For me, the #1 knock against LiberKey is its memory consumption -- 15+ MB of memory for a menu system that is mostly sitting idle is just too much, and on principle I removed LiberKey from my system. What I don't like about both PAP and LiberKey: when you launch any portable app within their system, a second helper process is always loaded at the same time and sits there until you close the app. I understand that this is necessary to maintain the app's portability, but it's still kind of annoying. That's why I only install a PAP app if there's no other way to make it portable. For example, does TreePad Lite really need to be part of the PAP platform? I've been using a portable version of it for years, so have no need to install it through PAP. The same applies to The Guide; a recent update added an option to make it truly portable, so I enabled this option and uninstalled the copy in PAP. One of the main benefits of installing all portable apps through PAP used to be so that you can quickly search for an app to launch it, but ever since Windows 7 you can pretty much do the same thing using the standard Start menu (you just need to add a shortcut). The other main benefit of using a portable app suite is to keep all the portable apps updated. However, the app update mechanism in PAP isn't very robust (and there's still no auto-update), so this benefit is larger than it seems. If you are against portable app suites, then you may consider downloading all your portable through FileHippo.com and using their Update Checker utility (http://www.filehippo.com/updatechecker). This is probably the best comment I have ever read! Thanks for the great comment and insight. I still go back and forth between these two suites. At school (I am a teacher) I use PortableApps in class because I feel it is a bit more stable, I can set the language (I am in China so everything usually defaults to Chinese; it is nice to have English), and I don't need many programs. When I am helping people with their computers, restoring files or whatnot, I will use Liberkey. Mostly because there is a larger selection of programs (specifically file recovery programs). PortableApps has maybe one or two programs that I use that Liberkey does not have, while Liberkey has a handful of programs I use the PortableApps does not. It goes to show that I really still can't definitively say one is better than the other. Like you mentioned each has their own merits. I guess it depends on the importance of the task at hand. Hopefully they both just keep getting better! Hey Jerry, thanks for the nice comment! 1) You can add other standalone programs, even if they are not on LiberKey's website. For example, I have Tor Browser, Server2Go, and the paid version of PDFXChange portable. 2) PortableApps and LIberKey do not offer the same programs. LiberKey offers a better variety of different apps. 3) Liberkey can be installed on your computer, allowing you to autostart apps of your choosing, and delaying them for as long as you like before they actually autostart. I like all the points you bring up. I have not used Liberkey for a while (I use Linux, not Windows) but I would love to try it out and see how it has progressed. It has always seemed to have a more comprehensive software selection. That is very interesting about delaying autostart. I like having that option. Please make a tuto how to turn a liberkey app into portableapps, or portableapps into liberkey. For the persons who'd like to switch. Do you have a tuto about how to portabilize an app into portableapps or liberkey format? What is the difference between those 2 formats, I didn't find this important info in your article though it's a very interesting article. For the most part, I agree with the author. Portable apps is smooth and stable and LiberKey has a few nice extra features. But the deal breaker for me are the updates. I tried the manual method for a year, but it just became too time consuming to keep up with. Portable apps has a superior staff by far that sends out updates within a couple of days of release. LiberKey hasn't updated a single program in well over a month.